Feel free to use my base as inspiration for your own seasonal shepherd’s pie. The goal is to find balance: each layer should play off the flavors and textures of the last one. Creamy should give way to crisp. 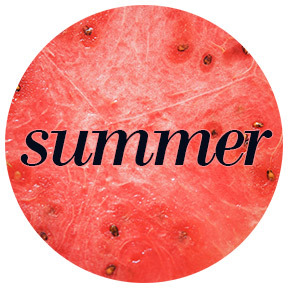 Sweet, spicy, bitter, and salty can all have their moment in the sun. It goes without saying that when you use vegetables at the peak of their season, you’re eating vegetables that taste like their best selves. 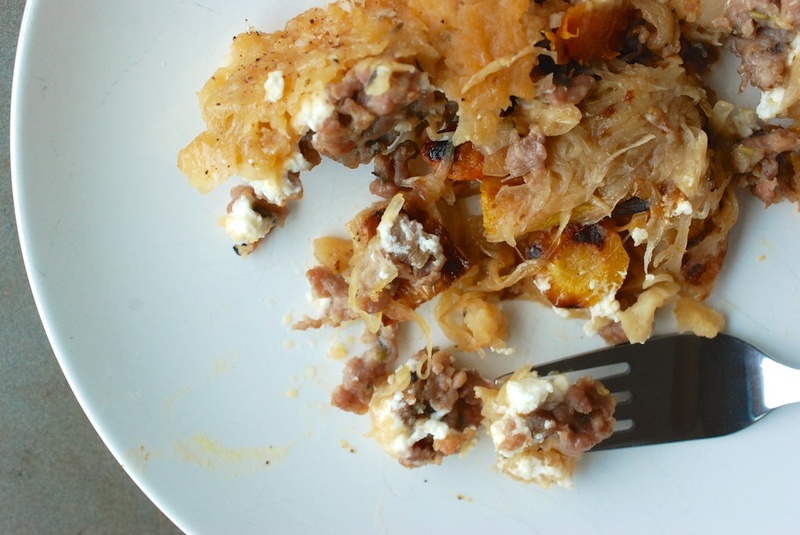 This recipe is also an opportunity to use up leftovers. Last night’s vegetables are fair game. 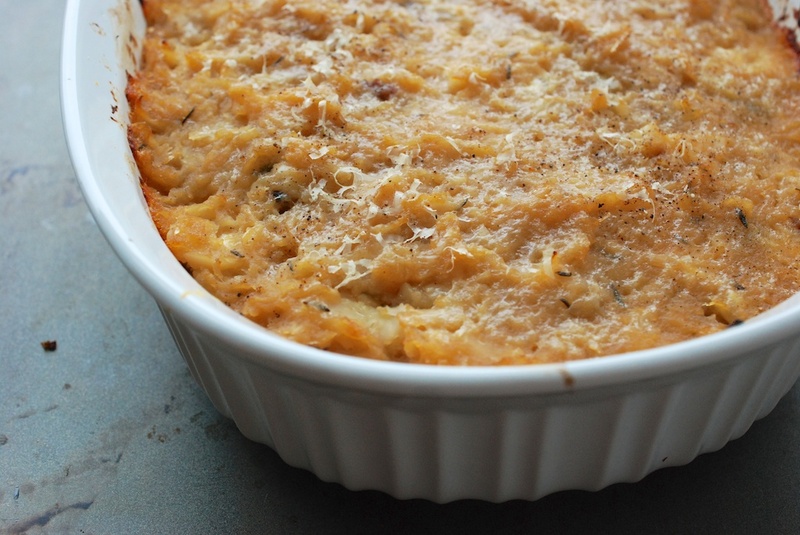 Any kind of puree–I’m thinking mashed potatoes, sweet potatoes, squash, or any other mashed-up root vegetable–can be spread over the top. This is a good time to use up those last nubbins of cheese. For the sake of full disclosure, you should know that I know this isn’t technically a shepherd’s pie, as it contains no lamb and no mashed potatoes. But you get the idea, right? 2. Scrub the fingerlings clean. Move them to a pot of cold water, and set the pot over high heat. Cook the potatoes until you can stick a fork about halfway into each potato, about 10 minutes. 3. 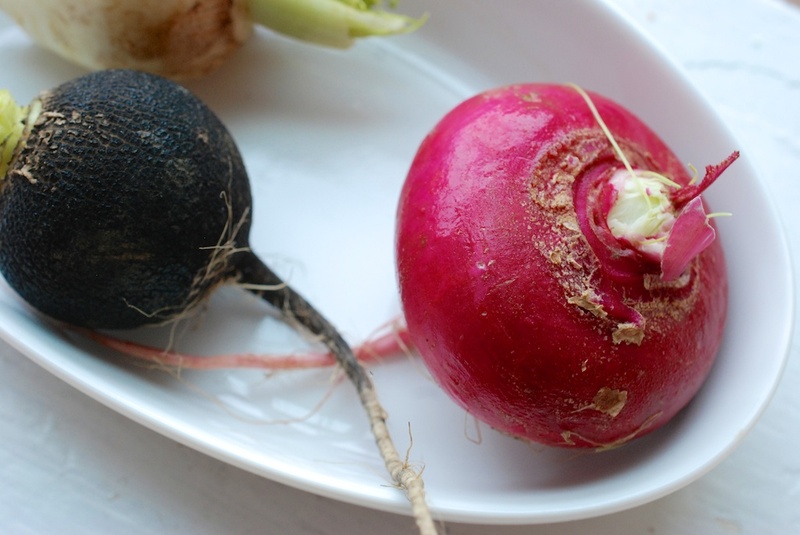 Scrub the radishes clean. Cut off any stems, whiskers, or any bits you can’t get clean. 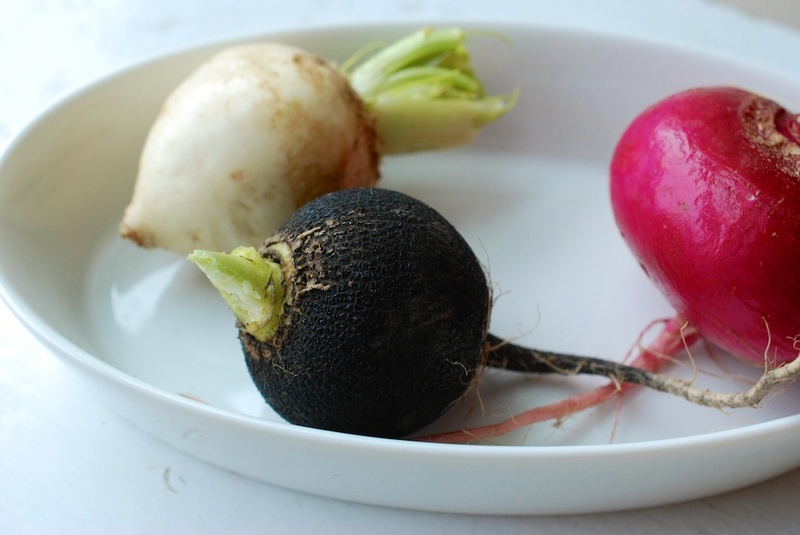 If you have any black radishes in the bunch, you should peel the skin off those. 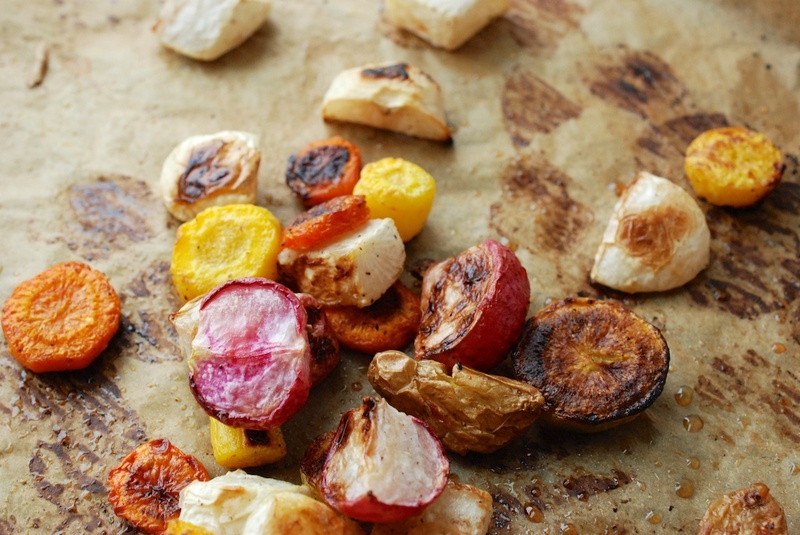 Cut each radish into slightly larger than bite-sized pieces (they will shrivel a little in the roasting). When you’re done, move the radish pieces to a large bowl. 4. Peel the carrots, and then cut them into coins about half the size of the radish bites (this should compensate for their different cooking times). Move the carrots to the radish bowl. Add the parboiled fingerlings as well. 5. 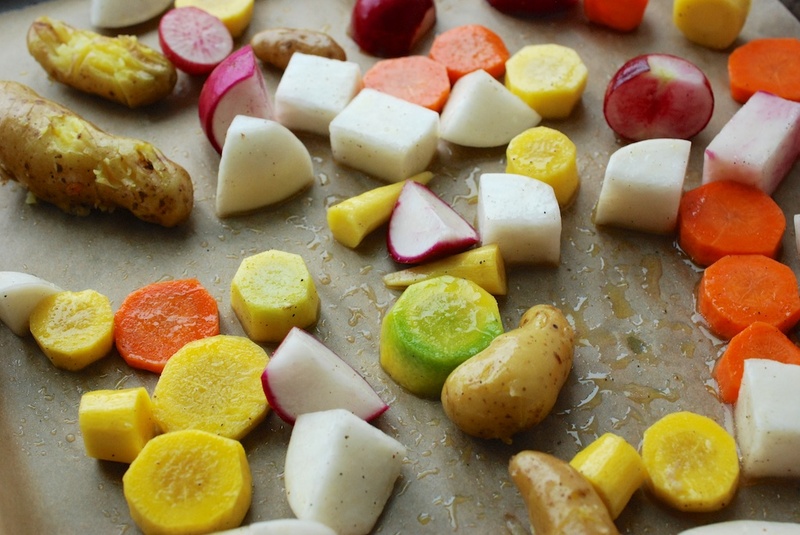 Pour a generous measure of olive oil over the radishes, carrots, and fingerlings. Thoroughly salt and pepper the vegetables, and toss them with your hands to coat evenly. 6. Move the vegetables to a baking sheet. Use a fork to smash down the fingerlings a bit, and then move the baking sheet into the oven. Roast the vegetables until all are wrinkled and caramelized, about 35 minutes. 7. While you are waiting for the vegetables to roast, tackle the celery root. Cut off all the whiskery bits. 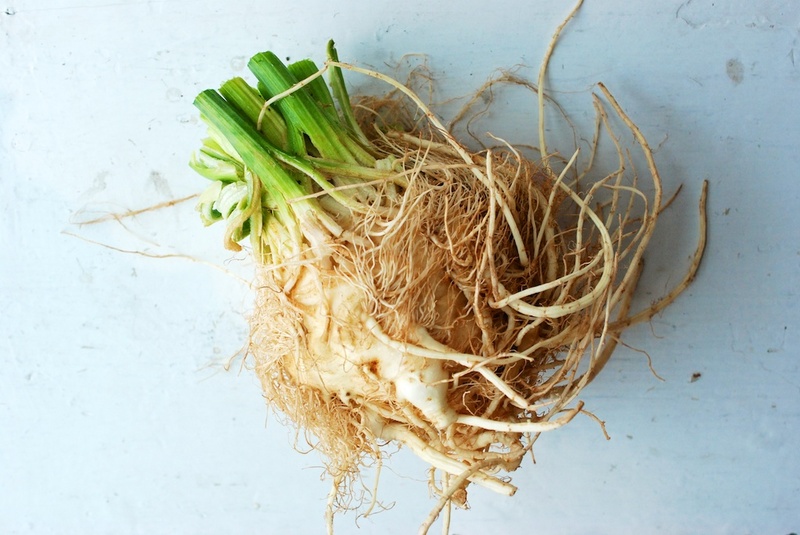 If you’ve never worked with celery root before, you will likely find this video useful. Now, cut the celery root into small-ish pieces. Peel, core, and dice the apple. 8. Add the celery root and the apple to a Dutch oven, or to a wide saute pan with a lid. Add the chicken stock and the thyme, and set the heat to medium. Put the lid on and let everything cook uninterrupted for 10 minutes. (Seriously, check after 10 minutes. Do not do as I did and resist checking under the lid until the smell of burnt apple becomes palpable.) When you can pierce the celery root with a fork, remove the pot from the heat. Discard the thyme sprigs. 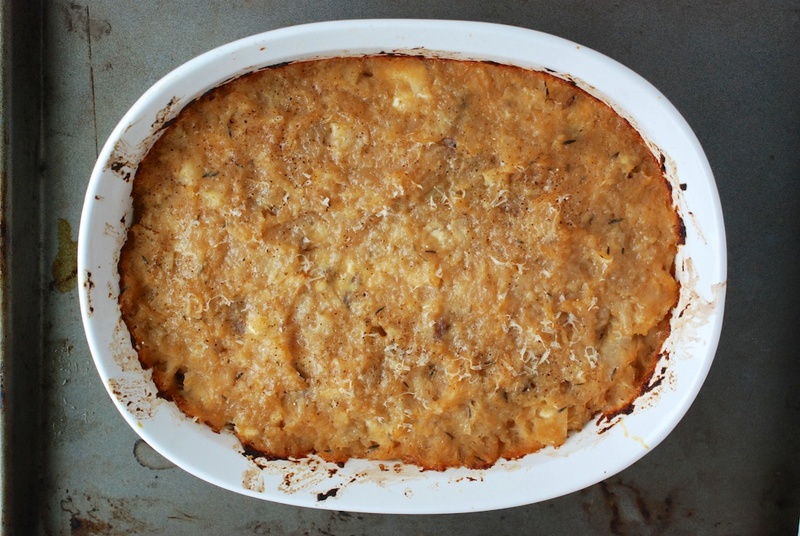 Use a potato masher (a large fork works too) to roughly puree the apple and celery root. Stir in the butter, and salt to taste. Set the pot aside. 9. At this point, or nearabout, the vegetables should be coming out of the oven. Give them a little splash of apple vinegar, if you like. While you’re at it, pop a carrot into your mouth. It should taste deeply of itself. 10. Now, tackle the sausage: Pour about 1 tablespoon of olive oil into a wide saute pan, and let it start heating up over medium/medium-low heat. Meanwhile, use a paring knife to gently peel the casings off each sausage. When the oil is heated, add the sausage meat to the pan. Cook, stirring occasionally to break the sausage into pieces, until no longer pink. You should have time to slice up the onion while the sausage is cooking. 11. When the sausage is finished cooking, remove it to a small bowl. Add the onion to the sausage pan, stirring as you go to dissolve the brown bits. Cook the onion until at least translucent. If you want to caramelize them, go for it. Whatever you have time for. 12. 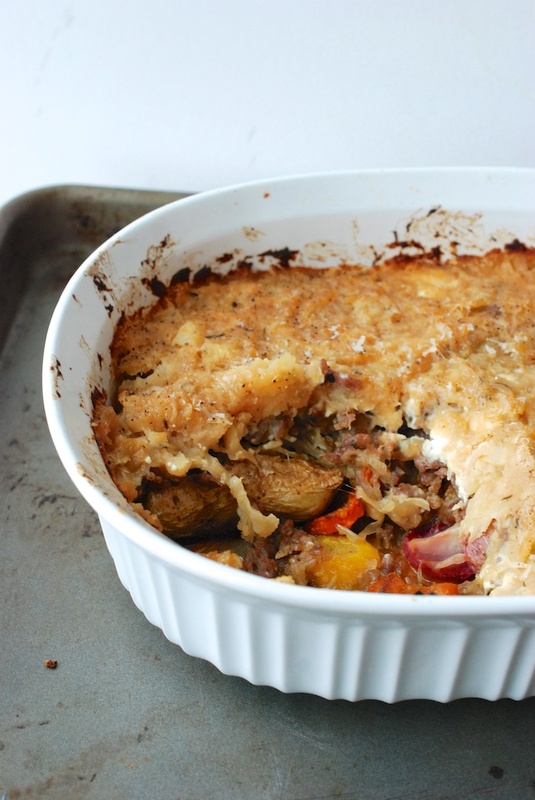 Now that everything is prepared, you want to layer all the ingredients into a casserole. I followed this order: radishes/carrots/fingerlings; onions; sausage; goat cheese; celery root mash. 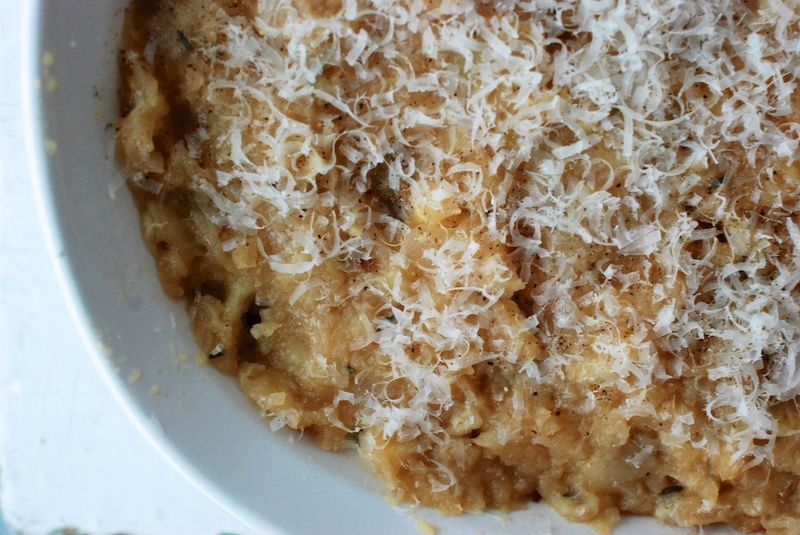 Try to seal in the other ingredients with the celery root mash. I sprinkled the top with freshly grated Parmesan and black pepper. 13. Pop that puppy into your 425F heated oven and cook for about 25 minutes. The crust should have hardened slightly, and the color should be more deeply golden than when it went into the oven. Serve warm.